ORANGE PARK - Clay County commissioners decided Tuesday not to purchase the Orange Park Country Club two weeks after it abruptly closed some of its amenities. During a meeting between commissioners, homeowners and the homeowners association president, the commission decided not to take on the country club because it didn't feel the development was feasible for the county to own. 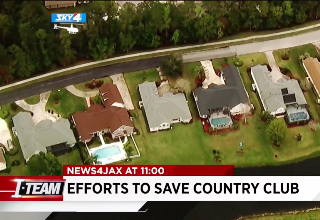 News4Jax learned last Tuesday that the club closed its golf course and tennis courts. John McCormack, the president of the homeowners association, proposed the county buy the golf course. County commissioners said they would need $15,000 to conduct a feasible study of the country club, which first opened in 1990. Ultimately, the commission decided it wasn't worth the cost. All but one commissioner felt the county government should not get involved. According to McCormack, former owner James Price had a hard time making ends meet and decided to walk away. He hopes someone comes through and saves the development. More than 600 residents live in the country club. Many worry about the future of the gated neighborhood.